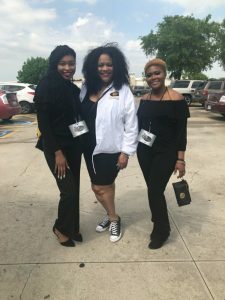 On April 3, 2018, Mr. Santoria Black Manager of Grambling State University Radio Lab and staff planned a Day Trip to Dallas for over 35 students from the Mass Communication Department. Mr. Black shared the the Radio Lab is a new online campus radio station in addition to the Grambling State University Mass Communication Department. In a short period of time, the students have worked hard to resurrect the department. Starting with only 6 students in little over a year, they quickly expanded to 42 students including 13 students that are producing radio shows that are members of the Radio Lab. While in Dallas, Mr. Black, students and staff had a chance visit one of the top radio stations in the Dallas/Fort Worth, K104 Hip-Hop and R&B. A few students were given the opportunity to do live radio remotes from the Dallas Mavericks game, which was heard on stations around Dallas/Fort Worth and North Louisiana. Also, the students attended the game where they had an opportunity to shadow the administration staff, and a few students had a chance to cover the game and wrote articles for a local newspaper in Dallas. The Collie J. Nicholson Alumni Chapter was one of the chapter sponsors for the Radio Lab Student Day Trip. President Shalonda Richardson, Collie J. Nicholson Alumni Chapter and President Greater Burton, Dallas Alumni Chapter and members met with students and staff for a meet & greet at Golden Corral in Grand Prairie. 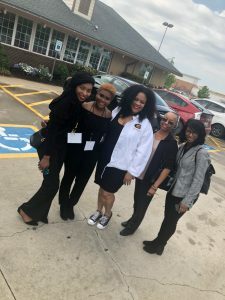 The students conducted a brief interview about the functions of the local Grambling Alumni Chapters regarding the roles/responsibilities as a Chapter President, etc. The interview will be aired at a later date on the Grambling State University radio station KGRM.